“Euthanasia” in animal control pounds and shelters is the number one documented cause of death of all cats in the U.S. The most comprehensive study to date indicates that 72% of all cats entering these facilities are killed. Just 23% are adopted, and only 2% are reunited with their owners. 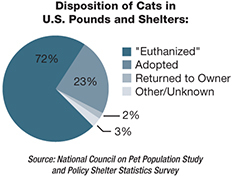 These statistics are from the National Council on Pet Population Study and Policy Shelter Statistics Survey, 1994-97. It surveyed roughly 5,000 shelters annually for four years, receiving responses from about 1,000. Although dated, it remains the most comprehensive and rigorous study that exists. More recent, less complete studies reflect the same trends—for instance, the 2006 National Animal Control Association Statistical Survey showed that 66% of cats were killed. For feral cats, the kill rate in pounds and shelters rises to virtually 100%. Cats entering traditional animal pounds and shelters have only three possible outcomes: being adopted, reunited with an owner, or killed. Yet feral cats are unsocialized to humans and can’t adjust to life in a human home, and they have no traditional “owners” to claim them. For them, the only possible outcome is death. Although the exact number of feral cats in this country is not known, some scientists estimate it is same as the house cat population, that is, 82 million. These animals are one of the most significant populations facing animal control pounds and shelters today. Yet feral cats are also the animals whom facilities are usually least equipped to handle. Indeed, many pounds and shelters classify healthy feral cats as “unhealthy” or “untreatable,” which excludes them from “healthy animal” kill rates. These cats continue to be funneled into a system in which all of them are killed. Animal nonprofits, research veterinarians, and other experts agree: killing in pounds and shelters is the leading cause of death of all cats in the United States. All are in agreement that too many cats are killed. Yet data collection and analysis on this critical issue are sparse. Only a handful of states require pounds and shelters to report the fates of the animals they take into custody. The reasons for requiring reporting vary, as do the thoroughness and accuracy of the reports. Millions of cats are killed every year, but no one knows exactly how many. And the killing is done behind closed doors, away from the public eye.